Snakes: you either love them or you hate them, there’s no other way! They are either the spawns of evil or the friendliest pets, according to people’s preferences. The fear of sneaks and other reptiles shouldn’t actually be a surprise since we’ve been thought that they are dangerous since we were little from one generation to another. With the development of cinematography, the image of the bad snake was continuously advertised in various movies and comic books leading people to believe that they are extremely dangerous. Even though supernatural evil powers were often attributed to snakes, they can be extremely friendly and those who have them as pets can vouch for this. 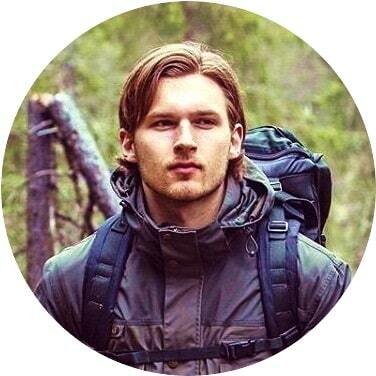 Still, regardless of preferences, you must know how to protect yourself from their fangs when you meet them in the wilderness and which ones can threaten your health. 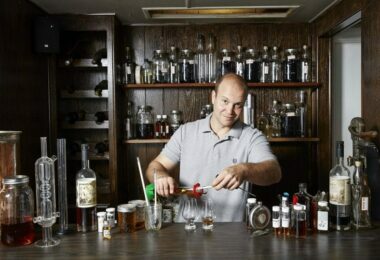 Snake venom is well known as a powerful toxin that can kill in a matter of seconds which is why prevention is the safest way. Snakes are quite territorial creatures and they don’t like to move so, if you know which ones are dangerous and the regions they prefer, you are one step closer to being safe. Also, snakes do not attack people unless threatened or disrupted so make sure to announce your presence when walking through tall grass and always watch where you step. Once you step over a snake’s tail it will come back and bite you before you are able to react! Before we begin discussing about the most poisonous snakes in the world, you should know that venom is not a snake’s only weapon. Big snakes, for example, kill their prey by suffocation. They wrap themselves around the prey and slowly tighten their grip until the unfortunate living being passes away. Read our article on how to avoid wild animal attacks and be safe. Scientifically called Oxyuranus microlepidotus, this snake is originally from Australia, the semi-arid regions in central-east. This type of snake cannot be found anywhere else in the world and even in Australia the specie is quite rare. The first ones to discover it were the local aborigines and the first ones to let the world know about it was Frederick McCoy in 1879. It is considered to be the most venomous snake on the globe after tests performed on mice and human heart cell cultures. According to results after the median lethal dose was administered, its venom is more toxic than any other snake or reptile on Earth. This is also highlighted by the fact that Inland Taipans are specialized in hunting mammals and their venom is adapted to species that have warm blood. Habitat: Queensland, South Australia, more specifically the black soil plains in the semi-arid regions. Physical characteristics: according to season, this snake’s color can vary from dark tan to a light brown combined with green. The color is also on various tones on its tail, back or sides. Most of its scales have dark edges and align in special patterns forming broken chevrons inclined either downward or backward. The dorsal scales don’t have keels which makes them smooth. The head is round and the neck is darker than the rest of the body. The iris of the eyes is a dark brown, almost black and the rim around the pupil is not easily noticed. Venom toxicity level: the estimates show that with one single bite, this snake can kill minimum 100 mature men that are healthy and well developed. 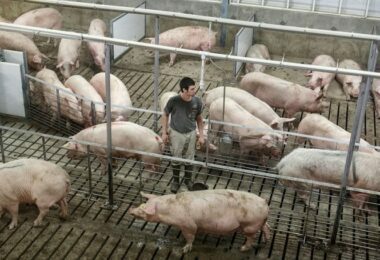 Also the maximum level of toxicity is achieved in less than 30 to 45 minutes according to the position of the bite on your body. This means that the person who was bitten will die in about 30 to 45 minutes if no treatment is applied. The Inland Taipan acts extremely fast and has great agility meaning that you won’t be able to actually see it before the attack. Its strike is extremely accurate and it can deepen its fangs in your skin several times, introducing venom almost each time. Behavior and nature: this snake is not aggressive and it is quite shy. When confronted, it will first try to find an escape way but if challenged and cornered, it will definitely attack. 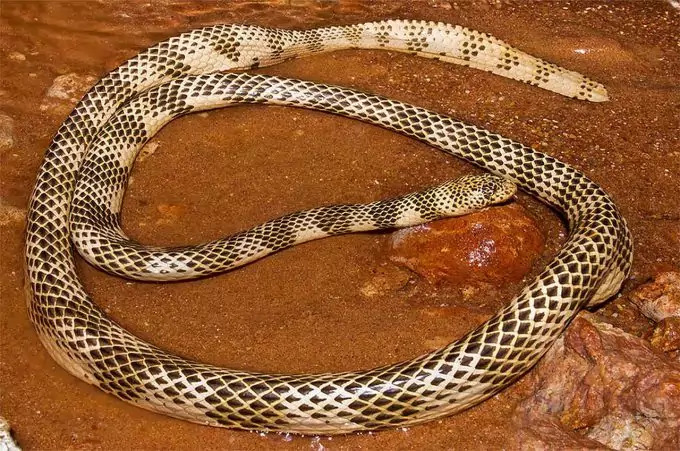 Due to its location, people rarely meet this snake which is a fantastic thing given the fact that it can kill you within minutes. Leaving Australia for now, we focus on Africa where the most dangerous snakes are the mambas. 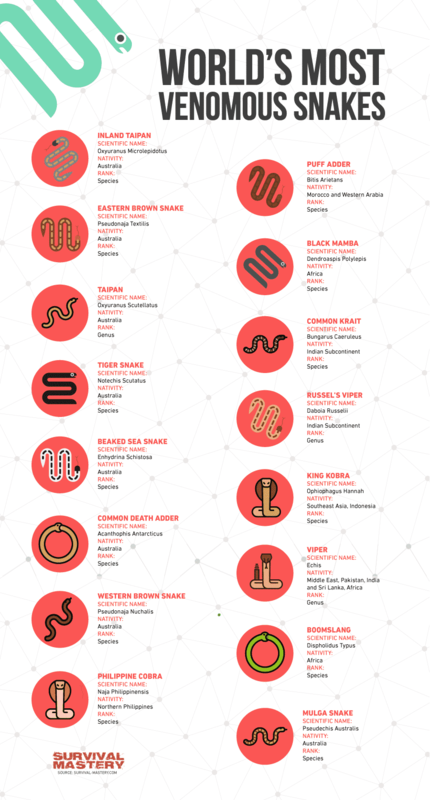 Among them, the Black Mamba is the most poisonous one as it can kill 10 healthy men with one bite. Yes, it’s a huge downfall from the previous member of our top but the Black Mamba has another advantage that makes it extremely dangerous: speed. This snake can reach 20 Km/h which makes it the fastest snake in the world and it can strike repeatedly when it attacks. 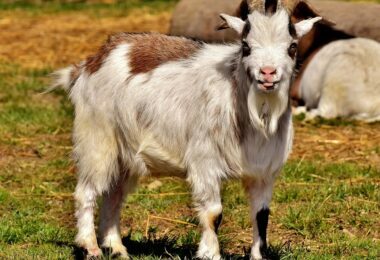 It is found only in Africa, in the Sub-Saharan region and if treatment is not applied its bite is deadly. The African Black Mamba was first made known to the world by Albert Günther, a German zoologist in 1864. Habitat: vast regions of the Sub-Saharan Africa like Sudan, Ethiopia, Democratic Republic of Congo, Uganda, Tanzania, Namibia, Burundi, Rwanda, Mozambique, Eritrea, Somalia, Kenya, Swaziland, Malawi, Zambia, Zimbabwe, Angola, Botswana, Central African Republic, Chad, Nigeria and Mali. Physical characteristics: Don’t expect that the Black Mamba to be actually black! The name was attributed due to the inside of its mouth (ink black) and the body is actually light brown to green and has grey tones. Some individuals may have dark spots towards the end forming diagonal bars. The body is quite large and round making a very powerful first impression. 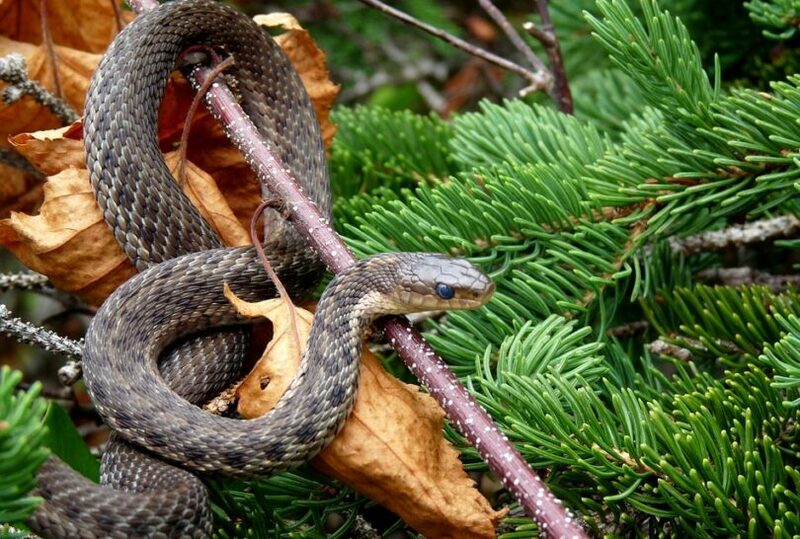 Young snakes are lighter in color and they get darker with age. The head is coffin-shaped and the eyes are of medium size. The eyes’ color varies from dark brown to black and there is a noticeable silver rim around the pupil. The African Black Mamba is around 6 to 10 ft long in adulthood but there have been reported cases of 14 to 14.8 ft adult snakes. The average weight of an adult specimen is about 3.5 pounds. 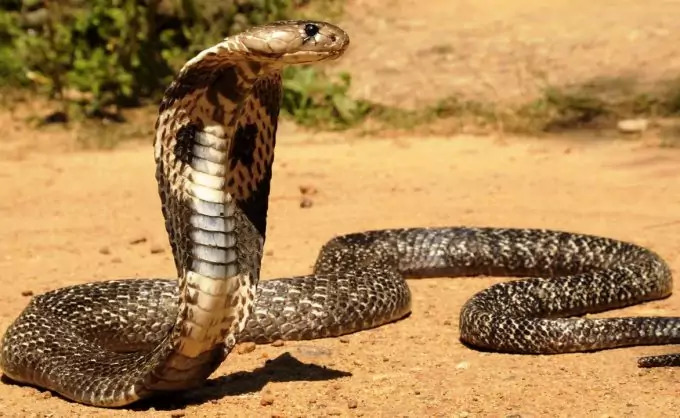 Venom toxicity level: One bite can deliver 100 to 120 mg of venom and, if left untreated, the bite leads to death in about 7 to 15 hours. The venom will knock a human unconscious in about 45 minutes and before the wide usage of antivenom all Black Mamba bites were a certain death. 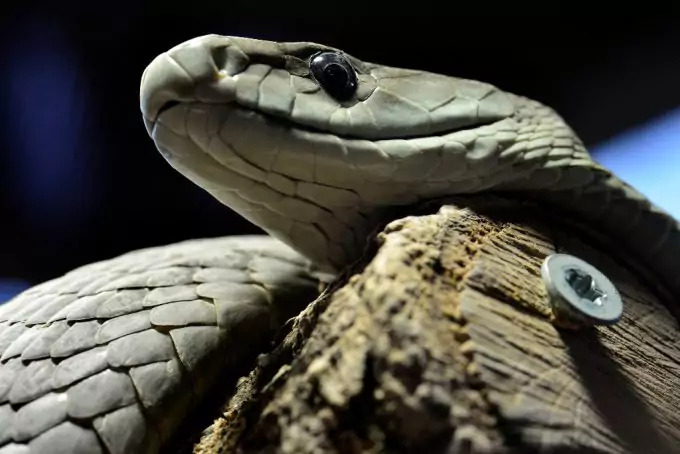 The South African Institute for Medical Research managed to develop antivenom specially designed for the black mamba bite. Behavior and nature: even though it is the most feared snake in Africa, the Black Mamba is shy and doesn’t like confrontations with humans. They avoid highly populated areas and don’t attack unless provoked or cornered. When challenged, it will first display its mouth, mimicking the cobra’s behavior in order to intimidate its opponent. Due to the fact that mamba is a big snake it is capable of raising high from the ground. Attention: if you meet face to face with a black mamba and it starts hissing and flicking its tongue, don’t do any sudden moves! This will definitely trigger an attack! The third most venomous snake in the world is a cousin of the one occupying the first place. It also shares the same continent: Australia. Called by scientists Oxyuranus scutellatus, the Coastal Taipan is a large, aggressive snake that lives on the coast of north and east Australia and New Guinea. Habitat: it can only be met in Australia, in coastal regions and in 2 provinces of Indonesia (west) and Papua New Guinea (east). Even though the name may suggest it, these snakes don’t like to live close to the beach which is why it can only be found in Cape York Peninsula, Queensland, New South Wales, and the Northern Territory. They prefer warm and humid areas where there is enough vegetation to camouflage them. Physical characteristics: This is the largest venomous snake in Australia reaching lengths up to 7 ft and weights around 7 lbs. Of course, larger specimens exist, but they are rare. The head is big, long and narrow with an angular brow. The face usually has a pale color and the body can be from olive green to reddish-brown. Some specimens can break the general rule tough, and their color is in tones of dark grey to black. The color tends to fade starting with the sides and, on the belly they are usually a pale yellow to white. Also, the coloration is seasonal, becoming darker during winter and returning to lighter tones during summer. The eyes are big, round and yellowish-brown in color with big pupils. 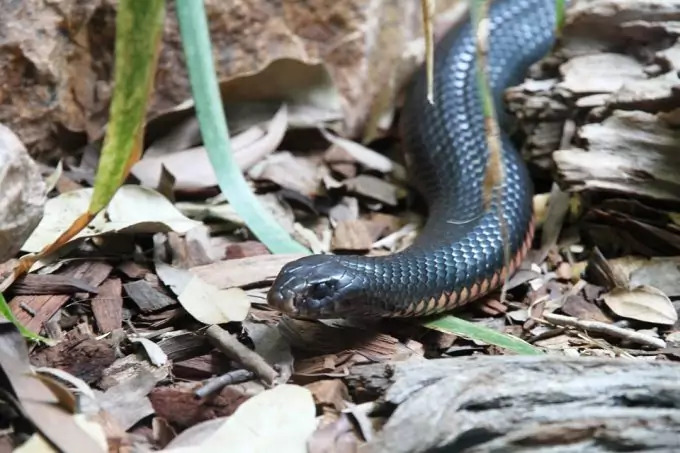 Venom toxicity level: one bite from the Coastal Taipan can introduce, in average, 120 mg of venom, quantity which is always fatal if untreated. The neurotoxin contained in its venom affects the nervous system and blood’s capacity to clot. If the quantity of venom is large (the snake stroke several times) dead can occur even after only 30 minutes. Otherwise, if treatment is not administered, a person would die in torture, after two and a half hours. Attention: All Coastal Taipan bites are deadly so you must go and seek help even if the bite looks superficial. Behavior and nature: This is an aggressive predator but when confronted with humans it prefers to avoid the encounter. Still if cornered or challenged, it will attack and strike several times with amazing accuracy and speed. Also called the reef shallows sea snake or scientifically, Aipysurus duboisii. It is considered to be the most venomous sea snake and it is definitely part of top 5 deadliest (venom wise) snakes in the world. The snake is named after its discoverer: Charles Fréderic Dubois, a Belgian naturalist. Habitat: Its main habitat is established in eastern Australia, New Caledonia and Papua New Guinea. This snake likes to leave in shallow coral reefs (260 ft depth) and eats various sea creatures that also inhabit the reef. Physical characteristics: color is not something you can base when trying to identify this sea snake because various individuals can have various colors and scale patterns. The specific characteristics are the wide head (slightly exceeding the width of the body), nostrils situated on the upper part of the head so it can breathe easily when it surfaces the water, and the eyes that are separated by a row of large scales. The back scales are usually smooth, but this is not always a general rule. Also, they are usually lighter in color on the throat and chin. The tail is long and the end takes the shape of a paddle for efficiency in swimming. Venom toxicity level: given the fact that this is a relatively small snake, it usually doesn’t pose a threat to humans. The quantity of venom introduced in one bite is about 0.43 mg which is extremely low compared with the other members of this top. Still, after laboratory tests, the results proved that among small creatures, this snake’s venom is deadly. For example, the median lethal dose or LD50 (the unit used to measure venom toxicity) is 0.044 mg/kg of body weight in mice. This number allows it to occupy a place in our top. Behavior and nature: This is not an aggressive snake and it won’t engage in an attack unless provoked. If bitten, seek immediate help. This is one of the easiest to recognize snakes due to its rattle. Usually found in North and South America, the Rattlesnake is native from this continent. They are scattered all over the world and can be found in temperate climates. They are predators but they can also be prey to big birds, weasels and other snakes. Habitat: They can be found in large numbers in the continental US, Texas, Arizona, in regions situated at the east of the Mississippi, Mexico, and South America. 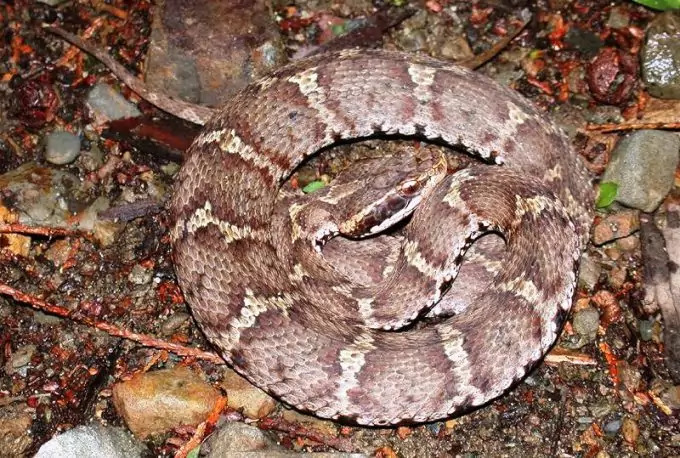 Physical characteristics: Besides the well known rattle and the specific sound of battle, the Rattlesnake is usually brown in color, mimicking earth tones. Also the patterns on the skin help them stay hidden from predators. The head has a triangular shape and their bodies are big. According to species, they vary in length from 1 foot to around 8 feet. The most dangerous is the eastern diamondback, this being also the species with the longest individuals. 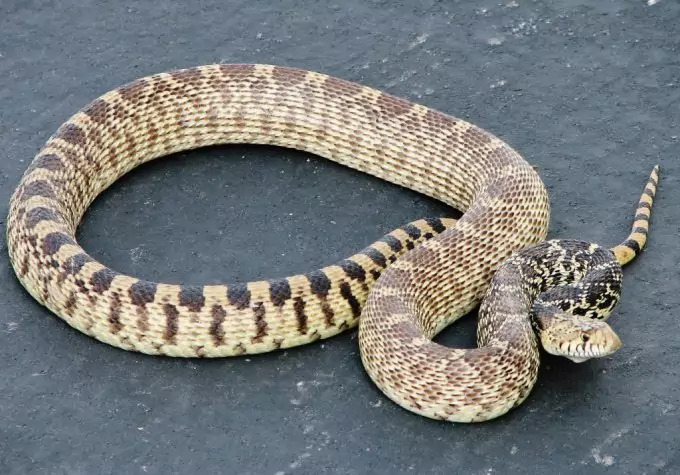 Venom toxicity level: a rattlesnake can control how much venom to insert with one single bite so if it will perceive you as a big threat, the quantity will be bigger. The venom is highly disruptive for the human body, damaging organs, preventing the blood from clotting and inducing paralysis. If the bite is left untreated it can lead to loss of limbs and, in some cases, death. Their venom is highly stable and resists well in time so older snakes will produce venom of higher toxicity. Also, bigger snakes are capable of producing venom in larger quantities. Behavior and nature: This snake is not aggressive towards humans and if startled will first try to avoid the confrontation. Still, if cornered, will not avoid a face to face attack. This snake is endemic to the regions of Japan, China, and Korea and it is considered to be most venomous one in these regions. Every year, around 3000 Japanese people are hospitalized and treated due to snakebites. Habitat: In the area of China, Japan and Korea, the Mamushi can be found in swamps, meadows, woodland, marshes, and rocky hillsides. It’s a snake that loves climbing trees and living in bushes. Physical characteristics: known as the most common snake in Japan, the Mamushi varies in color according to region. There is usually a background color (light gray, brown in combination with red or yellow) painted with irregular shaped spots with black edges and lighter in the center. The head is usually a combination of dark brown or black in the middle that continues with light gray on the sides. Venom toxicity level: known as being one of the most lethal snakes in Japan, the Mamushi snake’s venom measures a range of 0.3 to 1.22 mg per kg of body weight in mice. Its bite in humans can be deadly if not treated immediately and it can lead to kidney and lung problems even when the treatment was applied. 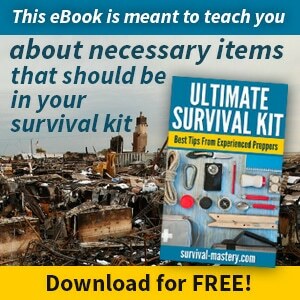 To recover, a person needs to be hospitalized for about 7 days. Behavior and nature: given the fact that his main diet is made of rodents and lizards (among others), it is met quite often in farmlands. Still, if not challenged or cornered, it won’t attack humans. Another snake that likes to live in Australia and it is well known all over the world for its speed and toxicity of venom. You can find it wherever you go in the continent and the population is increasing inspite of the fact that specialists consider it to be one of the most venomous land snakes in the world. Habitat: Victoria, Queensland, South Australia, New South Wales, the Northern Territory, Western Australia, and South Australia. Physical characteristics: the body is usually thick and not too long, reaching the maximum length of 3 ft. The coloristic is usually a combination of stripes in red, black and brown and the belly is pink or light yellow. The head is triangular in shape, wide and flat. Venom toxicity level: the venom can strike in about 30 to 45 minutes and if treatment is not applied in time, the bite can be deadly. The delivery system is fast and the snake can strike several times. 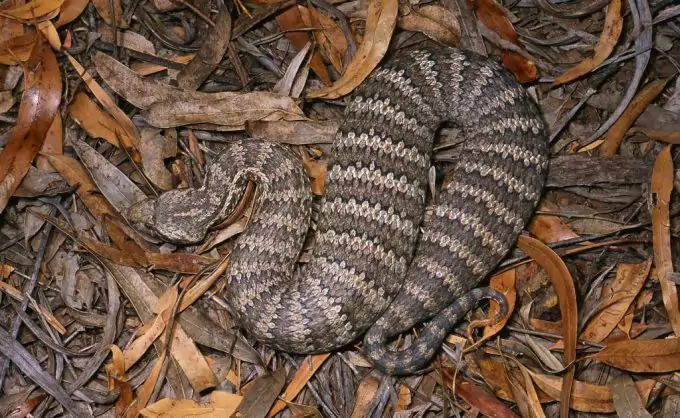 Behavior and nature: Fond of grasslands, forests, and woodlands on the Australian coast, this snake likes to surprise its prey using his coloristic as a camouflage. It will not engage willingly in a direct confrontation with a human being though. 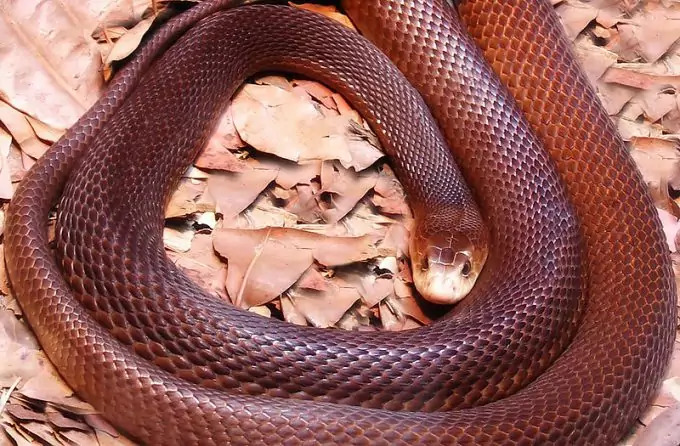 This is a rather interesting snake and you will definitely want to keep your distance from it. Also known as the spitting cobra, Naja philippinensis has the ability to actually spit you with its venom. It is native to the northern regions of Philippine and its diet is mainly formed of small rodents and other animals and birds. Habitat: the places where it is most likely to meet this deadly beauty are the islands of Mindoro, Luzon, Catanduanes, and Masbate. It likes humid areas with lots of vegetation (ponds, lakes, rivers) and it’s not scared to enter human habitat. Physical characteristics: as any species in the cobra family, this one can also form the legendary hood when threatened by expanding its cervical ribs. Its body can reach about 5 ft long and, in certain conditions, it can be even longer. The body is sturdy and the coloristic starts from light to medium brown in adulthood. Younger individuals are darker in color. The head ends with a rounded snout and large nostrils and the eyes are of medium size with round pupils colored in dark brown. Venom toxicity level: These snakes can envenom their prey from a distance of up to 9.8 ft away by accurately spitting their venom. A healthy, well built human being will collapse 30 minutes after the venom was administered and death is a serious possibility if treatment is not applied. The Philippine Cobra’s bite blocks the nervous system, the respiratory apparatus and induces paralysis. This snake’s venom is considered to be one of the deadliest among cobras. Behavior and nature: This Cobra is not shy and it won’t back down from a confrontation. It will not hesitate to enter inhabited areas, following its prey and you shouldn’t disturb it. Still, it will try to escape first when meeting a human being face to face. As you can see, most of the venomous and deadliest snakes of our Planet are not aggressive towards humans and don’t enjoy the confrontation. Only when cornered and threatened they prepare their weapons and strike with amazing speed and accuracy. In conclusion, if you don’t want to discover how it is to feel death crawling though your veins, it’s best to be prepared and take all your safety measures! Before you go on your next adventure, do check out our piece on forest survival tips to stay safe and protected.